Materials are delivered between clean rooms or non-clean-rooms of different grades. The specially-designed ozone generators can be used as delivery windows. The ozone constant-temperature sterilization or ozone sterilization dryer can be adopted according to the sterilization object. 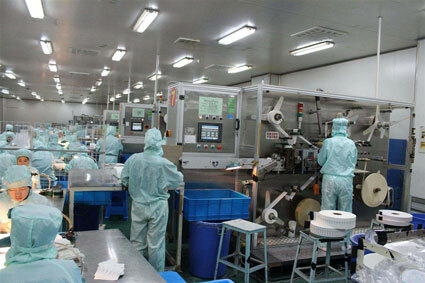 For example, the ozone constant-temperature sterilizing chamber used to sterilization of the aluminum plastic compound covers can avoid multiple work procedures (soak the sterilization target in the water or alcohol, and then dry it in the oven). Conduct sterilization of airtight vessels including the transfusion and material transport pipeline, filtering system, material storage tank and response tank. Choose the specialized ozone generator to generate the million-scale purified pressure air prepared by the oil-free pump into the ozone generating chamber. The oxidized gas with the concentration above 300ug/L is channeled into equipment or system requiring sterilization. Ozone generator can be adopted as the terminal sterilizer for the processing water use. Pump the ozone in the closed vessel. Stir materials in the vessel to conduct sterilization of dust raw materials and some TCM raw materials to cope with difficulty in sterilizing dust raw materials or some TCM raw materials. All the above oxygen sterilization should be equipped with the ozone gas detector. Monitor the ozone concentration on a real-time basis to achieve the best sterilization effect. Detect the ozone residual concentration after sterilization and ensure personnel safety. Consistency (repeatability) means that the reading of multiple detections is close to each other or even the same under the same test environment. The higher the consistency degree is, the better the performance of the gas detector is.